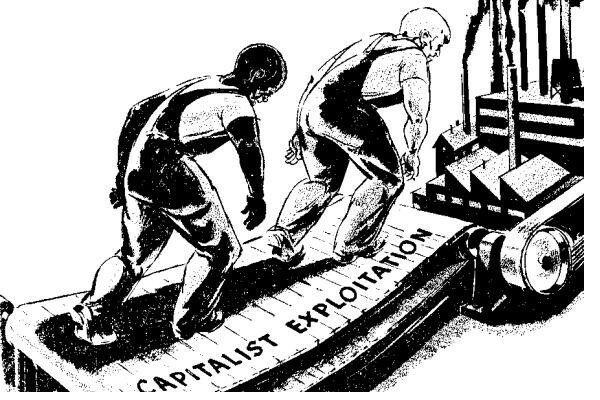 The myth that capitalism is exploitative – or rather, that capitalists and entrepreneurs are responsible for the exploitation of both workers and consumers – is almost as old as the history of this political-economic system itself, having been a primary driving force behind the growth of the state and, indeed, of outright socialist and communist revolution. Although much watered down from those early days, the idea that there is some kind of antagonism between the capitalist “class” and the rest of us seems to persist. As “Austrian” economists we know, of course, that it is absolutely and undeniably true that any free and voluntary exchange, upon which capitalism and private property must rely, only takes place because each party expects to benefit from the transaction. This alone is sufficient scientific proof to dismiss any idea that capitalism exploits one party for the benefit of another. Nevertheless we should, of course, tackle directly the specific incarnations of this myth as they appear today. The myth has its roots in the Marxian confusion of political castes with economic classes – the idea that the relationship between capitalists and workers, which is free and voluntary, was akin to that of king and subject, or lord and serf, relationships that were involuntary and subjected the masses to servitude. Caste systems were static and designed to keep people in their place; under conditions of free exchange, however, economic classes have a continually changing membership based upon one’s ability to serve consumers. This ability varies from person to person, of course, but the critical point is that nobody is legally prevented from becoming an entrepreneur and nobody, once they are a successful entrepreneur, has either their wealth or status legally protected. A wealthy capitalist might find his fortune decimated when he loses this crucial ability to serve consumers as the latter turn to other suppliers for their wares; he may have to re-join the ranks of salaried employees if he is to make ends meet. On the other hand, an ordinary worker may see a gap in the market that has been unnoticed by the current entrepreneurs of the day and he may set up a successful business accordingly. This does not mean say, of course, that political castes do not exist today. We can see quite clearly from bank bailouts and the like that there is a distinct upper caste that is protected from its mistakes and is able to retain its wealth and status at the expense of the rest of us. Indeed all the similar injustices that did occur during the early history of capitalism were not owing to the capitalists’ reliance upon genuine private property and free exchange – rather, they used the power of the state to enforce their illegitimate property interests. The mercantilist Corn Laws, for instance, which artificially propped up the price of corn for the benefit of domestic cereal producers are a good example from the early nineteenth century. Capitalism itself, however, does not produce these injustices. Moving on to some more contemporary arguments, do businesses exploit the “needs” of consumers for whatever it is that the latter want? Do they withhold “vital” and “necessary” wares releasing them only at extortionate prices thinking only of their selfish greed for profits? This argument is ridiculous because all trade and exchange relies upon the desires of the trading parties – whether it is for food, housing, cars, computers, or trips to the cinema. The entrepreneurs in business exist to fulfil and satisfy, not exploit these needs. If they are able to charge high prices it is only because the supply, relative to demand, is low and has to be rationed to those who value the goods the most. This argument regarding exploitation usually surfaces today in one of two situations. The first is during sudden supply shocks or demand spikes that send prices soaring and allow suppliers to book large profits as they obviously paid for the inputs at earlier wholesale prices which were much lower. As these usually occur during times of emergency or crisis, aren’t the businesses exploiting the dire need of the consumers for such staples as water, canned food and fuel? Such an argument ignores the fact that it is not the businesses driving the demand – it is other people who are willing to pay more to get their hands on the suddenly scarce items. The only options are to a) allow other entrants to be attracted into the marketplace by the higher prices, bringing with them more resources into the production of the scarce goods and thus lower their prices with an increased supply (thus solving the problem); or, b), to fix the prices of the wares below their market clearing level which would lead to guaranteed shortages as the existing supply is simply exhausted. Needless to say, government always opts for the latter. The second situation that attracts criticism is when the entrepreneur is in the business of providing something “essential” such as energy or healthcare. Yet these businesses are almost always so cripplingly regulated and interfered with by the state that it is impossible to define them as anything approaching free markets. Britain’s energy market is a case in point. Apart from the vast state bureaucracy that oversees the industry, idiosyncratic interferences such as threats by the government to either freeze or cap energy prices also take their toll upon consumers. One of the criticisms advanced is that firms fail to “pass on” any reduction of wholesale energy prices to consumers in the form of lower retail prices. But apart from the fact that the wholesale cost is not the only factor that suppliers have to consider when setting prices for their consumers, what are the chances of them offering lower retail prices now if they fear that the government will one day lock them into furnishing energy at these low tariffs in a future period when wholesale prices might be rising? In contrast if you look to any industry that the state tends to leave alone you do not find the same vitriol hurled at the dominant suppliers. Up until now we have seen that supermarkets, although subjected to food standards regulations that no doubt have served to raise prices, have benefited from relatively less state interference. Apart from a few murmurings from food purists and activists promoting local supply and produce, inexpensive food has ensured that they have never been a serious political issue. However, should food prices ever begin to rise, could we expect the state to start poking its nose increasingly into the food industry and blaming the resulting shortages and disarray on “exploitation” by the big supermarkets? Furthermore, if we follow the logic of the “exploitation” argument, we could also say that, given that trade is always a two-way process, the consumers “exploit” the need of businesses for money. These entities have suppliers and employees to pay and they are often desperate to get their hands on your cash. If some other business offers a lower price they could be left high and dry by your decision to shop elsewhere, threatening the employment and livelihoods of all of those people that work in the business you shun simply because you have the guile to find what you want for less! It is partly for this reason that the supply curve for consumer goods, once they are in stock, is generally vertical, with merchants willing to sell them for any price they can get simply to shift them and bring in at least some cash to meet their future outgoings. In a genuine free market businesses can never exploit anyone or hold anyone to ransom. A consumer would have the power to take his custom elsewhere if the business failed to meet his needs at an agreeable price. Although businesses as a whole set prices for consumer products and wages, no individual business can do so and each one must be prepared to sell goods for, at most, as much as the next business, and to pay wages at least as high. These boundaries can be crippling if the selling prices are lower or insubstantially higher than the costs that the business must bear. Businesses, unprotected by state privilege, therefore have to be on their toes constantly in case someone comes along with a better offer. The beneficiary of this process is the consumer-employee, who always knows he is paying the lowest price for what he buys and receives the highest wage for his work that can ever be paid.